Panasonic DMP-BDT260 review | What Hi-Fi? Our first encounter with the Panasonic DMP-BDT260 was a positive one. It’s a five-star product for us, although just missed out on an Award recently. That’s due to its principal rival, the Sony BDP-S5200, which offered a top-quality experience with a smaller price tag. Now the Panasonic has gone from £120 to £80. Time for a rematch. Put on After Earth and it’s clear we have another sterling performer on our hands. In the very first scenes, pictures in space show impressive contrast: stars look bright against the deep black canvas, and big white spaceships look striking. Motion is smooth and judder-free as spaceships cruise along, managing to remain stable during the jerky movements when the ship loses control. Fine detail is the Panasonic’s forte too, digging up texture in the characters’ rubbery bodysuits and conveying subtleties in facial expressions. Rich and punchy colours are instantly arresting. Greens in the wildlife are lush and bloody carcasses are bright red. There’s a tinge of over saturation to the lustrous colour palette, but we like its ability to make content eye-catching. Skin tones remain well judged though, rendering natural complexions and realistic shadows on faces. Switch Blu-ray discs to Rush and clean whites on the car’s bodypaint offset oily blacks on tyres. There’s good texture on the latter, and that sense of wear on the seatbelts shows it’s really paying attention to detail. 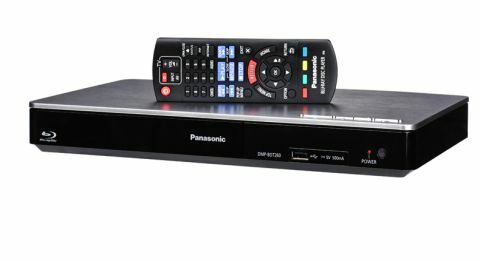 Like the others in Panasonic’s new range (bar the BD81), the BDT260 supports 3D. Load Harry Potter and the Deathly Hallows Part 1 Blu-ray and it’s every bit as impressive. The picture is pin-sharp and stable, while much of the detail and rich colour balance apparent in 2D content is present and correct. Badly handled motion can be particularly uncomfortable in 3D, but this Panasonic takes erratic broomsticks dodging traffic and weaving in and out of one another in its stride. Those who still have large DVD collections will be pleased: it does a fine job upscaling standard definition. With Star Wars: Return of the Jedi, there’s radiant shine to C3-PO’s gold metal body, and impressive punch to the brick-red landscape. As for sound, it’s classic Panasonic: revelling in richness, with a good deal of weight that grants it authority. Voices are full-bodied. Explosions have punch. It’s not the most agile performance (the Sony BDP-S5200 has the edge here) but we like the Panasonic’s smooth, never-tiring presentation. As well as disc playing, you get USB playback and DLNA for accessing files from a network or compatible storage device. You will need an internet connection for the latter, which can be achieved wirelessly thanks to the BDT260’s built-in wi-fi. A LAN socket provides wired access. As far as files go, it supports numerous formats including MKV, MP4, FLAC, AAC and WAV. You’ll also find the usual YouTube, Facebook, Netflix and catch-up-on-demand apps pre-loaded on the BDT260. It’s the bare minimum we expect for smart functionality these days, but it works well: loading content is fairly quick, and USB devices are recognised right away. The Panasonic interface is intuitive, and navigating menus is straightforward too. Getting from A to B can feel a bit long-winded, though, and requires some patience. The lack of a display is a niggle. If your household has conflicting tastes, a multi-user mode lets up to four people store and save their customised settings too. Panasonic doesn’t offer a control app for this year’s players, remaining reliant on a physical remote control. In keeping with its previous design, it’s lovely to use: buttons are nicely spread and well positioned. We said at the beginning that this is a five-star product, and that’s worth repeating here. It might not have the most comprehensive list of features, but its performance easily makes up for it, especially with the price drop. Against the Sony BDP-S5200, however, the Panasonic is giving a bit too much away. The Sony just lets you do more.